For medical purposes, an eye patch keeps light out and allows the eye to rest and recover following an accident, surgery or procedure. Eye patches are also used to treat amblyopia, also known as lazy eye. If you are putting together a last-minute costume, you also might need an eye patch. Making your own eye patch is a better alternative to store-bought eye patches, which may break easily or are applied through adhesive which can irritate the skin with frequent use. Measure your eye socket. Use your measuring tape to measure the diagonal length from the top of your eyebrow to the top of your cheek bone. You want the eye patch to cover the entire eye socket, especially if it is meant to keep light out for medical reasons. Use a piece of white chalk to trace an irregular circle onto a piece of dark-colored fabric, based on your measurements. You want the fabric to be thick and dark so it keeps light out, and soft so it is comfortable to wear. Polar fleece is a good fabric for a makeshift eye patch. Cut out your eye patch design. At the top and bottom corners, diagonally across from one another, cut a small slit in the fabric about 1/2-inch from the edge of the fabric. These slits will hold the strap that holds the eye patch in place. Measure the circumference of your head diagonally across your eye. Remember that this measurement is for the elastic that will keep your eye patch in place. Therefore, subtract approximately 1 inch to 1 1/2 inches off the measurement so the eye patch will fit snugly. Cut a length of elastic. Feed the elastic through the slits you cut in the fabric. Fold the elastic over at the end and sew a strongly reinforced stitch on the side that will sit against your face. To decorate your eye patch, cut shapes and designs out of craft foam. Consider designs such as hearts, flowers or a skull and cross-bones. Glue the designs to the front of the eye patch. 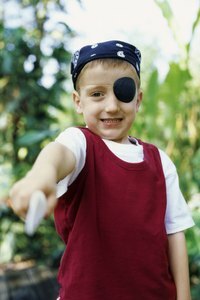 Decorating the eye patch makes it easier to get kids to wear, especially if they must wear it for medical purposes. Decorations can also be tailored to fit a theme if your eye patch is for a costume party. Do not to use any glue or adhesive that will leak through to the side of the eye patch that will come in contact with your eye. Allow glue to fully dry before wearing the eye patch.